This entry was posted in Skip Allen & Painter 12 and tagged Corel Painter 12.1 video tutorials, Karen Bonaker, New in Corel Painter 12.1, Skip Allen. Bookmark the permalink. Thanks Charlie! As you can see in the video, I’m not sure I had a grip on all of it. Plugins are new for me and I think all of you knew more about them than I did. Nobody knows it all…that’s impossible. Thank you Skip & Karen for todays webinar…..
I’ve just installed Ptr 12 last month and the Update 12.1 this past weekend … am a bit behind with things and was wondering about the following…. With the 12.1 Update, is it still necessary to also install Serv Pk 1 from last Sept or would the recent Update 12.1 include all past amendments/improvements etc? With the 12.1 Update, is your video on Brush Libraries and Brush Installation still valid as is……….I have yet to successfully install brushes so your video is my guide. Wondering also about Painter Extra Content…..does the 12.1 Update have any impact on that……should I follow your Brush Installation video for the Extra Content as well? Have Windows 7 and working on a HP Desktop 6GB ram / 1.5 TB hard drive. Not sure if this is the right place to ask these questions…if not …pls advise. Thanks again for today’s session and any other info you may provide. This is a great place to ask questions; I will try to answer them if I can. Is it necessary to also install SP-1 prior to the 12.1 update? I do not know the answer, but I would recommend it. However, if you have already installed 12.1 and it is working fine, then I would say stay with it. If you start having problems, then you may need to start over. It depends on the types of problems. Here is what I would do. Un-install Painter 12 completely. Install Painter 12 from your disk. I would install the SP-1 Patch and then open Painter with a shift start the first time. Then I would install the 12.1 update and again open Painter the first time with a shift start. Be sure if you have custom stuff, that it is backed up or save your workspace as discussed today. My video on Brush Libraries and Brush installation needs to be updated. It’s methodology would still work, however, now that we have the new brush management system, I would create libraries and install brushes very differently. That will be my first update video. Painter Extra Content should be fine and not impacted by either the patch or the update. @barb – In case you haven’t found out yet, yes, you need to install SP1 first as the new update will only recognise that version number. Thanks Joe, I wasn’t sure, but I was pretty sure you needed to install SP-1 first. Oh and thanks Skip and Karen! 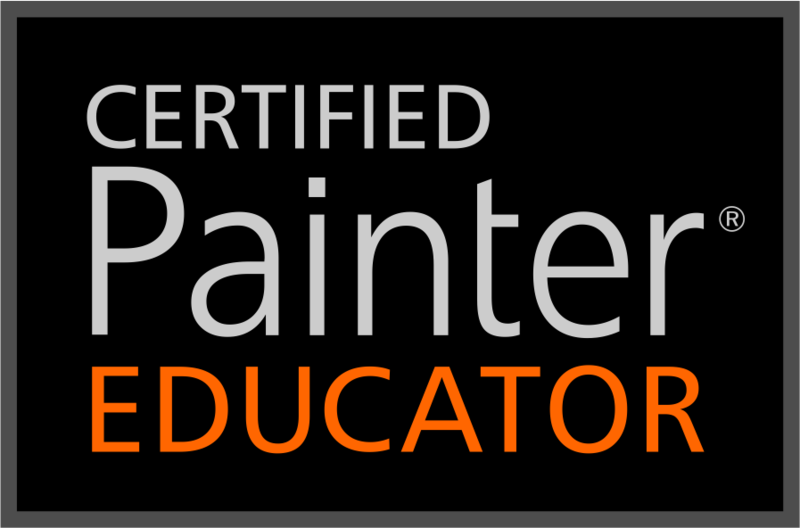 I downloaded the “What’s New in Painter 12.1 Webinar” Is this just a recording? or a VIDEO, All I am getting is sound. You should be getting sound and images. You may need to download the latest version of video players. Some MAC users have difficulty and need Flip 4 MAC. Or there is a wonderful free video player that will work for MACs or PCs called VLC media player. I would try VLC first. If you still have trouble, please let me know. Thanks for replying, appreciate. enjoy your website and your expertise. I solved the problem, I was able to open it in My I tunes application. In Photo Shop 5 There is a plug in available which you can download from Adobe’s Website called Pixel Bender . Can this plug in work in Painter 12.1? I tried installing it in painter but it doesn’t show up in Painter 12.1.Pixel Bender has some great effects for photo shop cs5. Also I installed third party Topaz Simplify 3 and it works great in Painter 12.1. I’m not sure. I have Photoshop CS5.1, but I have not used plug-ins very much. Sorry, but I don’t think I can help. Have you tried asking questions at Painter Factory? Someone at that forum may know the answer. Thanks, Skip I will check out the painter factory.